It was twenty-eight years ago. These are the things I remember about fourth grade. There was the red dirt playground of Saint Williams, my first baseball mitt, Little League, and my father’s transfer to Taiwan, all that year. Each has finally wrought its conviction; each is just now finishing its work of grace. Ever since I was a very young child I wanted to be old. Not “older”, but old. There was something about old people that was more than just a fascination with how their skin was like tree bark, or how a particular one or another limped, or how they spoke with some gravel in their throat. They were mystical, magical people who, it seemed, were alive but were somehow living in two worlds. It comes unannounced. It has no warning signs. 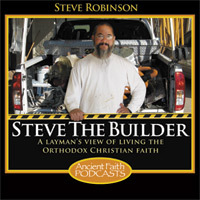 This is the second podcast of a series recorded while travelling through the deserts of Arizona and Nevada to St. John's Monastery. Something caught my eye and I stopped. This is what I found about 80 miles from civilization. Steve the Builder is on the road. Join me on my trip to St. John's Monastery in Manton, California, where I will be working on their new church for the next few weeks. I just traveled through about 1,000 miles of desert and stopped at a lot of interesting and sobering places along the way. Companion pictures for this podcast and more from the trip are on my blog at http://pithlessthoughts.blogspot.com/2009/05/in-desert-of-sorrow-and-sin.html.